MOA and AOA are two types of documents common in forming a limited company. Both documents are necessary to form such a company as well as a reference document to provide information for the company’s stakeholders, shareholders, and potential investors. When forming a limited company, both documents are deposited to the company’s registrar, who approves the incorporation. The MOA stands for Memorandum of Association. It outlines the nature of a business entity. The memorandum includes the company’s name, registered company address, the company’s aims and objectives, limited liability clause, share of capital, and other related company information. Today, the Memorandum of Association (MOA) and Articles of Association (AOA) no longer form the constitution of the company. Under the law passed in October 2009, the Memorandum of Association also contains limited information compared to the Memorandum of Association of the previous years. The memorandum is a prerequisite for all companies. It is considered as the absolute company document, which means that all alterations or amendments are restricted. The memorandum contains two objectives – the main and subsidiary objectives, as well as six types of clauses, which are: the name clause, registered office clause, object clause, capital clause, liability clause, and association clause. The memorandum cannot limit a company on its actions. Recent developments slashed the object clause, which places restrictions on a company’s activities and actions. Today, the main purpose of the Memorandum of Association is to state the intention of the first stakeholders to form a company. The Articles of Association, also known as the Articles of Incorporation, are another important company document. Like the Memorandum of Association, the articles are an important requirement in forming a company as well as legally establishing one. Minimally referred to as “the articles,” this particular document is now regarded by the law as the single, constitutional document for a company in the United Kingdom. It also carries other duties previously carried by the Memorandum of Association. In essence, this document articulates the way the shares are distributed, voting rights of each class of stock, valuation of intellectual rights, activities of directors including appointments and meetings, management decisions, and many other intricate and internal processes of a company. The document is also designed for shareholders and potential investors in that it outlines the rules and regulations for internal management of a business. Another characteristic of this document is that it spells out the types of power, responsibilities, and authority of the elected directors of the company. 1.“MOA” stands for “Memorandum of Association,” while “AOA” is the acronym for “Articles of Association.” Both are legal documents drawn up when starting and forming a limited company. In the past, both documents comprised the constitution of the company. 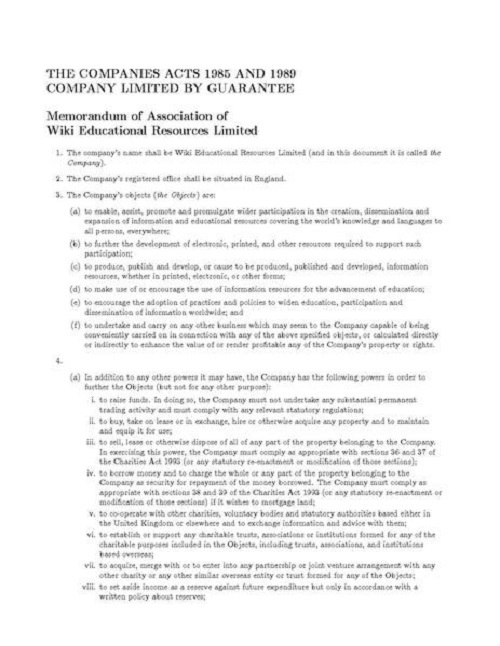 2.The Memorandum of Association was formerly known as part of the company’s charter or constitution. It is the foremost reference about a certain company or other company information. It lists the company’s name as well as other essential information of the company as a business entity. Meanwhile, the Articles of Association detail the internal management of the company as well as power, responsibilities, and other activities of the company’s shareholders and directors. In addition, the Articles of Association have been considered the charter of the company after the passing of a law in 2009. 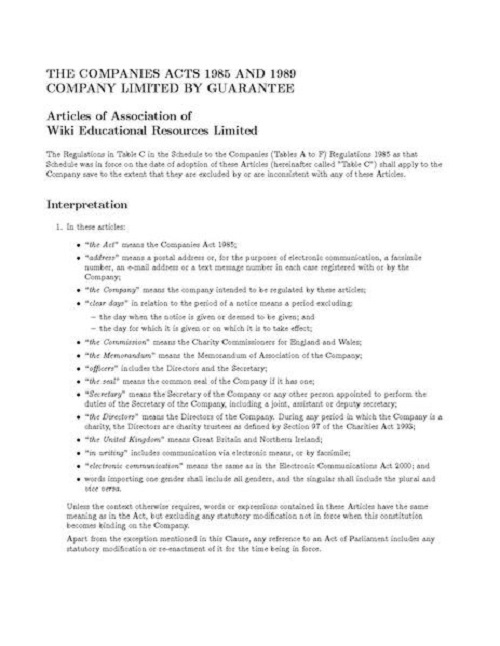 3.The Memorandum of Association has two kinds of objectives and six types of clauses. One of its clauses, the object clause, has already been eliminated. This particular clause limits a company’s activities and actions. In contrast, the Articles of Association list the responsibilities, powers, rights, and authority of the members of a company, mainly the stockholders and directors. Celine. "Difference Between MOA and AOA." DifferenceBetween.net. July 31, 2017 < http://www.differencebetween.net/business/planning-activities/difference-between-moa-and-aoa/ >. Nice it really helped me to balance the fracas between the two documents.